In 1997's "The Lost World", Jeff Goldblum's character remarks "Oooh! Ahhh! That's how it always starts. Then later there's running and screaming." However, in the case of the latest entry in Steven Spielberg's multi-million dollar dinosaur franchise, "Jurassic Park III" skips the 'ooohing' and 'ahhhing' and gets right into the 'running and screaming'. Gone are the debates of control vs. chaos or man vs. nature (or any sort of conflict between the human characters for that matter), and in their stead is one big long chase à la "Speed". Returning to the franchise is Sam Neill ("The Dish"), who reprises the role of Dr. Alan Grant he played in the first "Jurassic Park". Eight years have passed since his first and only visit to Dr. Hammond's dinosaur Disneyland, and he is adamant about ever setting foot there again. Unfortunately, funding for his research has all but dried up to a trickle, and his fundraising lectures only draw the interest of those who have questions about his trip to Isla Nublar. 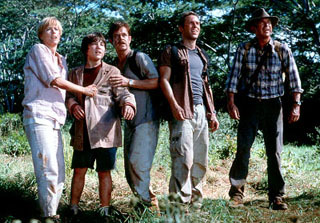 Enter Paul Kirby (William H. Macy of "State and Main") and his wife Amanda (Tea Leoni of "The Family Man"), who want to hire Alan as a tour guide for an excursion to Isla Sorna, the location of 'Site B' seen in "The Lost World". Despite his vow to never go back, the promise of extensive funding for his ongoing digs quickly changes his mind, and before he knows it, he is on a private plane with the Kirbys, with his gung-ho protege Billy Brennan (Alessandro Nivola of "Face/Off") in tow. How many times can we watch (let alone believe) people stupid enough to land on an island inhabited by dinosaurs, only to find themselves woefully outmatched and end up spending the rest of the film on the run? That was the problem when it came to writing the script for "Jurassic Park III", in which there was no Michael Crichton-penned novel to use as source material. 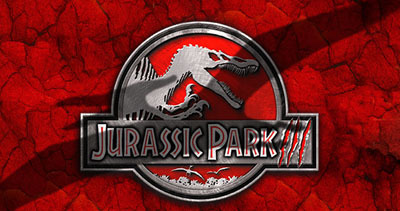 Thankfully, despite having been greenlit by Universal Pictures without a completed script (which is never a good sign), "Jurassic Park III" still manages to hold together as a pure visceral roller-coaster ride, as long as you don't think too hard about the script's narrative shortcuts (especially the sudden and incredulous ending) or scant character development. The focus is on the action, and as a result, the running time of "Jurassic Park III" is relatively short at only ninety minutes. Though audiences may already familiar with seeing dinosaurs munching on humans from the first two films, director Joe Johnston ("October Sky") manages to offer a few new interesting wrinkles to the "Jurassic Park" shtick to keep things fresh. In addition to a nail-biting sequence involving a flock of pteranodons and a hilarious bit involving the new Spinosaurus and a cell phone (both worth the price of admission alone), the velociraptors have developed the ability to communicate with one another and to reason to a limited degree, making them even more dangerous adversaries (fans of "Aliens" may see a number of similarities between the plot of that film and the use of the intelligent velociraptors here). Performance-wise, the acting is passable given the paucity of meaty acting roles found in the script. Neill is solid as usual, as is the effective turn by Morgan as the Kirbys' spunky and resourceful son. Macy's portrayal of the befuddled Paul Kirby is reminiscent of his portrayal of the bumbling Jerry Lundegaard in "Fargo", only without an ounce of malice, while Leoni and Nivola are passable in their thinly-sketched roles. In addition, another "Jurassic Park" alumnus, Laura Dern, has a brief and thankless cameo as fellow paleontologist Ellie Satler who saves the day by answering a phone call. "Jurassic Park III" may not offer much in terms of originality or story, but it is still a fast-paced and fun thrill ride that doesn't wear out its welcome. Like its two predecessors, there is little doubt that this latest installment will do well, and that the pteranodon's seen flying into the sunset at the close of the film will somehow end up in "Jurassic Park IV".